of their newest leather jackets in an attempt to help you prepare for your next mission. The REV'IT! 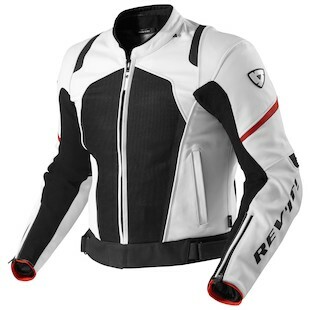 Stellar Jacket has you covered for warp speeds with revised Dual-comp protectors at the shoulders and elbows backed by ProLife CE approved armor (the same armor used in their race suits). The new pieces have a smaller profile to improve comfort and flexibility without reducing protection. A long or short connection zipper completes the bond to a pair of pants for track duty or paved road shenanigans. Taking over the Tarmac Air Leather Jacket slot in the model line, the Stellar is better suited to temperatures on Endor rather than Tatooine (think less perforation), a detachable body warmer vest is included too. While not warm enough for Hoth, it should help to take the chill out when ripping around Cloud City. The Aero hump has disappeared and provides for a cleaner look, while the rear deflector shield (back protector) pocket is designed to accept the new CE 2 certified Seesoft back protector insert. The Stellar will be available in Black/White and Black/Red in Euro sizes 46-58, Hyperdrive not included. The next model we found in our R2 unit was the REV'IT! Galactic Jacket. Prepared to conquer multiple atmospheres in style. The Galactic is comprised of a Leather/Dynex mesh hull with a removable Hydratex waterproof liner, this is the Phoenix Jacket reborn. Rising from the ashes the Galactic fills a hole in your jacket fleet when looking for maximum protection and increased airflow. On warm summer days the Challenger cooling vest can be added in place of the Hydratex liner for the ultimate in warm weather performance. ProLife CE rated armor provides impact protection in the shoulders/elbows and the optional Seesoft back protector upgrade will cover your rear flank. This new back protector is rumored to transmit less then 6 kn of force (3 kn less then the minimum requirement for CE 2 certification). Impressive, most impressive! A REV'IT! Women's Galactic Jacket will join the armada as well. 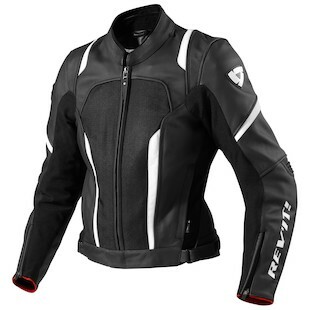 The women's jacket has a sleek profile and includes all of the features of the men's version. 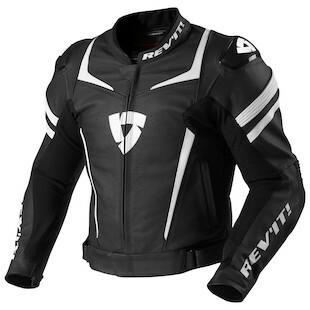 Color options are White/Black or Black/White, either way this jacket will be a great asset on your next crusade. With names like space ships, it's hard not to poke a little fun at the 2013 REV'IT! leather Jacket line. All kidding aside, these look like some intriguing updates and should create some disturbances in the Force.